Kara’s Cupcakes came to us with a unique issues: traditional ecommerce platforms are not designed to with the needs of a bakery business. Specifically for Kara’s Cupcakes, they required a system that would sort and distribute orders for production in 7 different business locations for delivery and pickup. After redesigning their website and integrating the easy-to-use CMS known as WordPress, we created a custom business solution to meet their unique ecommerce and reporting needs. Create a CMS based website with a customized eCommerce for decorating and ordering cupcakes. In addition to the eCommerce, a system that would sort and distribute orders for production in 7 different business locations for delivery and pickup. 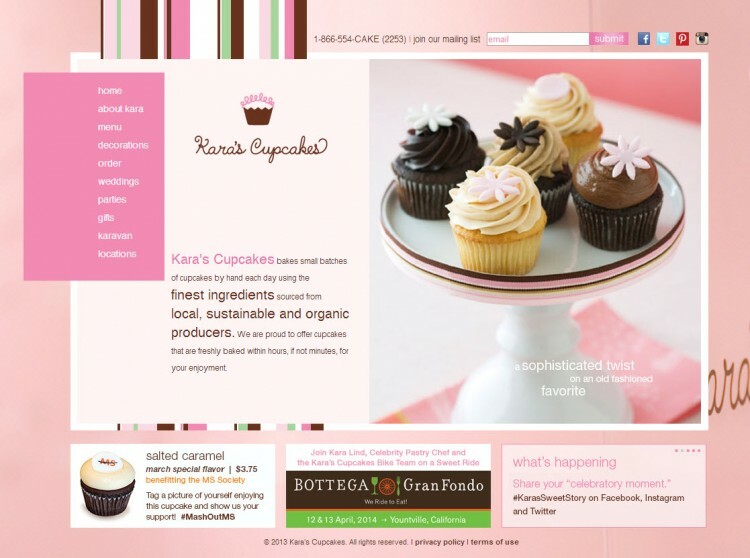 Kara’s Cupcakes approached us with the goal of converting their hard coded html website to a scalable CMS based website.